We know you have the most questions when it comes to demolitions regarding buildings. This is, after all, what people think of typically when they wonder about demolitions services. We are Grand Rapids Demolitions, a company based in Grand Rapids, Michigan. We know you have a lot of queries when it comes to how we take down building, and we will attempt to answer them all. 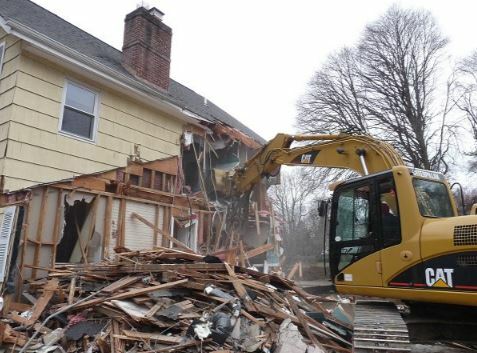 When it comes to building/house demolition, you may wonder if you can take down a house with your hands. Demolishing a home is an arduous process. If you want to do it yourself, you will first have to obtain all the necessary permits. Then you will need to disconnect every service that you have coming to your home. Finally, if you have any toxic substances, you will need to stop and call in a professional for removal. Then you will need to fence off the property and rent an excavator. Make sure you also rent large garbage bins for the rubbish. ​What Is Building And House Demolition? As you can see, a DIY project requires a lot of work and expertise. This is why a lot of people opt for professional services. The average cost of demolishing a house can vary greatly when you enlist a company in Grand Rapids, MI. Our company is happy to provide a quote for you regarding your property. We will be respectful and keep our costs to a minimum. Building a new home in Grand Rapids, Michigan is an expensive process. The average cost can be close to $300 000. That's why we would recommend that you spend the money to have the property cleared for you. It will give you a fresh start and spark new inspiration. Our house demolition process involves taking all the necessary steps to make sure that you get the best. According to the National Demolition Society, demolition is a highly complex task. It can even involve the use of explosives for home implosion. Homes with asbestos require special care. It was used for insulation, fire proofing, and sound proofing before it became a regulated substance. It is often found in flooring and roofing. It is a hazard to health and therefore, the removal must be performed by professionals. This is because it is a cancer causing substance. Most of the time, our work with asbestos is what increases the services' time. However, it is important to handle this health hazardous substance with care. House demolition companies in Grand Rapids specialize in keeping you safe while a residential property is destroyed. They also care for the neighborhood by ensuring that any asbestos does not get air born. As we modernize, we are finding that some substances previously used in homes should not be used anymore. So some people opt to demolish homes with harmful chemicals so that their family does not get sick. We welcome your questions regarding the residential demolition process. We are used to working in the Grand Rapids area so we are familiar with the procedures that need to be taken. Call us for a quote today to begin your demolition process.